Sometimes it’s hard for a child to give up a favorite toy or blanket as they get older. 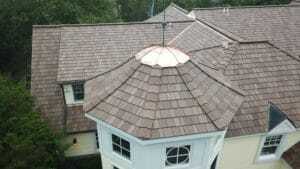 The challenge can be the same for a homeowner who knows it’s time to replace a cherished real cedar shake roof. “Ten years ago our company maintained and restored the original cedar roof on this house because the homeowners loved their real cedar shake so much,” says Mark Dalrymple, president of steep roofing operations for Butcher and Butcher Construction Co., Inc. in Michigan. “The goal was to get it to last another decade, which was achieved. “However, now it’s 10 years later. The homeowners came back to us because they knew their old cedar shake roof had reached the end of its lifespan. According to Dalrymple, the homeowners immediately approved of the DaVinci Multi-Width Shake product suggested by Butcher and Butcher. “They were impressed with the authentic look of the composite shake tiles,” says Dalrymple. “The Autumn color was a great match for the weathering affect they were seeking. 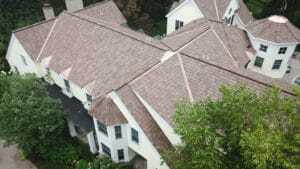 “We’ve been installing DaVinci composite roofs for 18 years so we’re very familiar with the product,” says Dalrymple, whose company has locations in both Michigan and Florida. “For this project we used extra caution to protect the home’s meticulously manicured landscaping, courtyard and pool area. “This is a neighborhood of quiet, rural residential properties,” says Dalrymple. 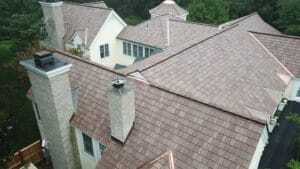 “For us it’s an honor to help these homeowners have composite roofing installed on their homes. We know that this roofing material will help both protect the home from severe weather and add distinct curb appeal value to a property.